The interior light can be turned ON regardless of door position. The light will go off after a period of time unless the ignition switch is placed in the ON position when any door is opened. The interior lights can be set to operate when the doors are opened. To turn off the interior lights when a door open, push the switch, the interior lights will not illuminate, regardless of door position. 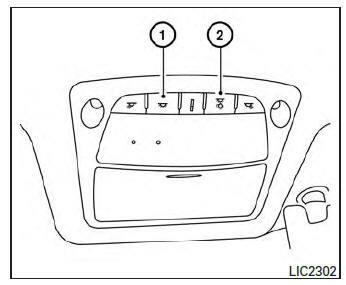 The lights will go off when the ignition switch is placed in the ON position, or the driver’s door is closed and locked. The lights will also go off after a period of time when the doors are open. The step lights illuminate when the driver and passenger doors are opened regardless of the interior light switch position. These lights will turn off automatically after a period of time while doors are open to prevent the battery from becoming discharged. Do not use for extended periods of time with the engine stopped. This could result in a discharged battery. 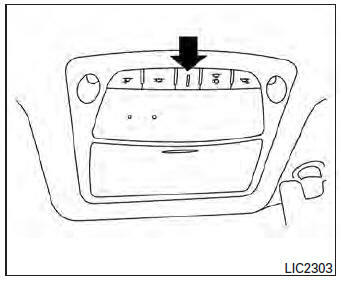 The console light will turn on whenever the parking lights or headlights are illuminated.